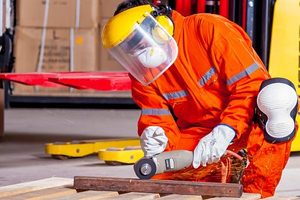 Industrial safety encompasses a huge category with products that protect every part of the human worker from workplace injury. While here at Ear Plug Superstore, we do not offer everything worker safety related, the products we do offer are made by the top producers in the world, and we provide them at excellent prices, with fast shipping, and knowledgeable friendly customer support. If you do not find exactly what you need, please let us know. We will do our best to help. Browse our selection of safety gloves. Safety glasses with built-in ear plugs are an excellent and convenient way to take care of two different, important safety concerns. By combining eye protection with hearing protection, safety glasses with ear plugs make it easier to stay safe on the job, at your home workshop, or when shooting at the range or afield. Disposable respiratory masks are a critical safety item for many different situations, and getting the correct model is crucial. We offer three top rated brands--3M, Honeywell, and Moldex, and we are adding more brands to increase the options for customers. Whether you need a simple, inexpensive, non-rated dust mask, or one that is rated for oil-laden environments with organic vapors such as paint thinner, or welding environments carrying acid gasses, we have just what you need.